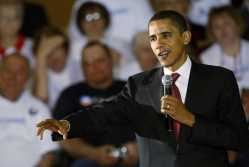 David Zalubowski ~ The Associated Press Democratic presidential candidate Sen. Barack Obama, D-Ill., spoke during a town-hall meeting Friday in Casper, Wyo. CHICAGO — Barack Obama would not be leading the Democratic presidential race without the enthusiasm and high turnout of black voters. Moreover, some analysts think it's possible Obama's heavy black support is nudging some working-class white Democrats into Clinton's camp. If true, it could be an important factor in a contest that remains tight after a year of campaigning. But Clinton won nearly two out of every three white votes in Ohio, and 56 percent of those in Texas, where she also ran well among Latinos. Strategists are pondering the results, wondering if Pennsylvania's demographic similarities to Ohio will deliver another important win to Clinton in six weeks. Ohio exit polls support Walters' view. Eighteen percent of white Ohio voters said race was an important factor in their decision, and of that group, three in four voted for Clinton. In the intraparty world of Democratic primaries, however, racial divisions are much less prevalent and hard to measure. Many white Democrats, especially in the South, tend to be liberal, racially tolerant and usually happy to join blacks in opposing Republicans. The Obama-Clinton rivalry may be straining that comity. Some blacks resented remarks Clinton made in New Hampshire, which they viewed as minimizing Martin Luther King Jr.'s role in achieving landmark civil rights laws. And after Obama's South Carolina victory Jan. 26, former president Bill Clinton seemed to equate the Illinois senator with Jesse Jackson as a candidate who could not draw widespread white support. Bositis said it was unclear whether Obama's black support is driving some working-class whites into Clinton's corner, but he noted the steep drop in Obama's share of the white vote in Ohio compared to Wisconsin. One possible factor other than race, Bositis said, was Clinton's strong support within the Ohio Democratic establishment, starting with the governor.